It has been announced in the last few minutes that the St Johns Wood based chamber is to close. Just over a year ago, on Monday 15th January 2018, NHS England launched a 30 day public consultation to review Hyperbaric Oxygen Services. At the time NHS England stated they thought that hyperbaric oxygen services "were over provided and an unnecessary cost to tax payers" and they proposed to reduce the number of hyperbaric chambers from ten to eight. NHS England also said that hyperbaric oxygen therapy "could be used for other applications but there was not conclusive evidence of the efficacy of these applications." The London Diving Chamber, London Hyperbaric Chamber, British Hyperbaric Association (BHA), British Diving Safety Group (BDSG) Diving Diseases Research Centre (DDRC), Scuba Industries Trade Association (SITA) and the diving agencies all lobbied the Government stating that they were concerned that closing a chamber would have a detrimental impact on hyperbaric medicine treatments. The general diving public also responded in great numbers, and NHS England extended the consultation period to 16 March 2018. It seems that the mass outpouring of positive support for the English diving chambers was not heard, because it has been confirmed that the London Diving Chamber will close. (LDC has been providing a medical service to divers for 15 years.) The NHS contract for treating decompression illness has been awarded to the London Hyperbaric Medicine Chamber at Whipps Cross Hospital. Hyperbaric Oxygen Therapy can be used to treat burns, radiation tissue damage, soft tissue infections, problem wounds, gangrene, carbon monoxide poisoning and Necrotising fasciitis. It has been used to treat other conditions, ie traumatic brain injury, stroke, MS and Parkinson's disease but this is considered as "off-label" in the UK. 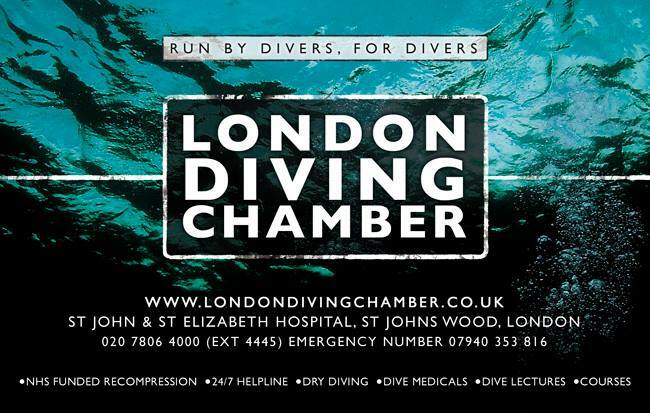 The London Diving Chamber is the only BUPA and Private Health Insurance recognised chamber in London. This facility will now be lost to those able to pay for HBO to help heal broken bones and injuries. Diabetes is on the rise, and it is estimated that more than one in 17 people in the UK has diabetes. HBO therapy is a useful mechanism to help manage problem wounds, ie diabetic foot ulcers. These ulcers require a healthy, oxygenated wound bed to heal. If the wound does not receive enough oxygen, the normal healing process can slow or even stop, resulting in amputation. There have been controlled clinical studies comparing amputation rates in HBO-treated diabetic foot ulcer patients (8.6% - 12%) versus non-HBO treated patients (33% - 40%). The results in preserving limbs are very positive. However NHS England does not fund hyperbaric oxygen treatments for diabetic patients, despite the European Committee for Hyperbaric Medicine and the European Tissue Repair Society stating that evidence was reliable that HBO was effective in reducing major amputations in patients with diabetic foot ulcers. Currently over 8 million people live in London - that equates to 470,500 people who will suffer from diabetes. If NHS England funded oxygen therapy treatments at the London Diving Chamber, it would save a lot of limbs, improve patients quality of life and probably reduce long term care cost to the NHS. The London Diving Chamber has proactively educated divers for several years. In 2005 they established an annual lecture evening at The Royal Geographical Society, London attracting diving luminaries such as researcher Dr Dawn Kernagis, cave explorer Rick Stanton, Professor Trevor Norton and cinematographer Doug Allen. The evening has been a valuable fundraiser for the Scuba Trust. At present it is not known whether this inspiring event will continue. It is believed that the London Diving Chamber will close at the end of March 2019. UK divers are therefore advised to revise their paperwork and update the recompression chamber information.